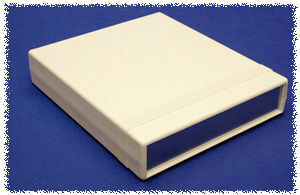 Desk top electronic instrument enclosure, ideally suited for mounting printed circuit boards. Molded from flame retardant ABS plastic (material carries a UL flammability rating of 94V-0). Link here to our more economical version (no inserts and molded in general purpose plastic). Two sets of vertical 1.5 mm (0.062”) P.C. 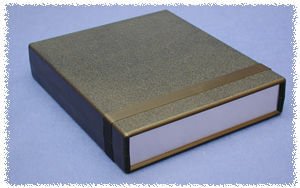 board guides are molded into case halves front and rear. Front and rear panels are 1.6 mm (0.064”) brushed aluminum with paper on one side. 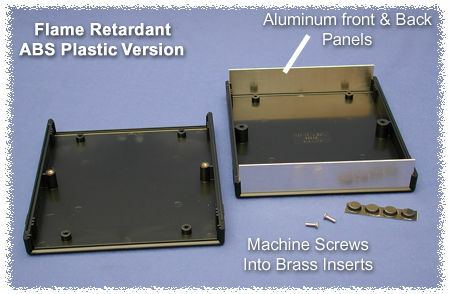 Cases halves are secured with M3 x 0.5” x 10 mm (0.39”) Philips machine screws threaded into tapped integral brass bushings. Perfect for applications with repetitive assembly and disassembly are required. Integral horizontal P.C. card mounts on Eurocard centers. Stocked in matte textured black and grey.